Gardens are often made to replicate a historic style which may be in-keeping with their situation. And such historic styles of themselves may be a good enough reason to shape a garden space and plant it with appropriate plants. Islamic gardens have served for centuries as an oasis in the desert to feel closer to ones beliefs. Enclosed by protective walls and served by a water source flowing outwards, every element and individual plant playing a symbolic role in the design of these formal gardens. Medieval gardens of Western cultures were once created as safe havens in an otherwise hostile world. The high walls of the hortus conclusus offered protection and created a space in which to relax as well as grow plants to nourish both body and mind. Simple geometric arrangements of flower beds allowed useful vegetables and herbs to be grown. 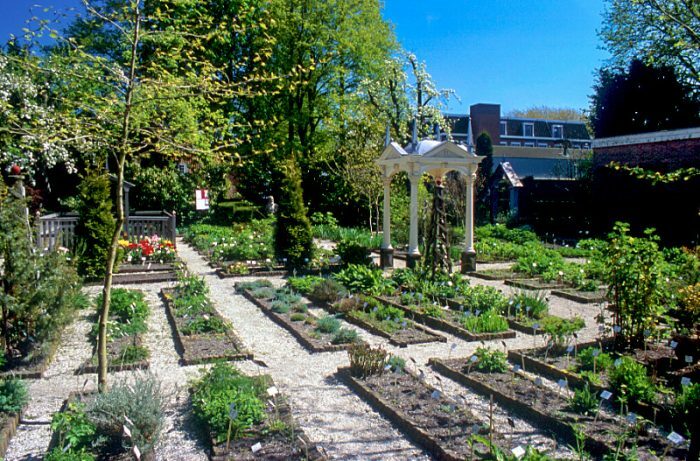 The apothecaries garden is a form of such a garden where various medicinal herbs were grown in logically arranged beds around an available source of water. Alongside these in monasteries, cloister gardens occurred, often surrounding a central water well. 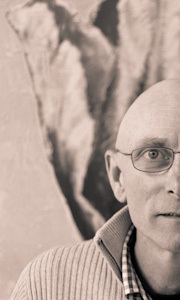 These uncluttered spaces offering the monks a calm retreat in which to think and to study. All of these models might be used today to create a garden space that is sheltered, peaceful and focused upon itself rather than any surrounding chaos or outside influences. Their walls bring separation, as do our garden fences, and water is both used symbolically and as a necessity. In this third Mind Garden design I want to use the elements of enclosure and water, but at the same time not try and reproduce a copy of an Islamic walled garden or a Medieval herb garden. The design idea I have evolved is to place a simple source of water in the very centre of the garden: a small round pool or a large bowl overflowing with water will be enough. The walls will not be the boundary fences, but plants set within the garden using a combination of evergreen shrubs (clipped Taxus hedges) and rows of upright growing grasses. The grass used is Calamagrostis x acutiflora ‘Karl Foerster’ as its height and stiff upright growth habit develops quickly in early summer and prior to this is will bring bands of fresh growth amidst many spring flowering bulbs, especially tulips. In winter the short Taxus hedges will stand free as upright specimens within the open garden and become surrounded by low-growing perennials and drifts of bulbs in spring. As summer arrives the grasses will grow up between the Taxus hedges and together they will become the enclosing walls of this contemporary hortus conclusus. 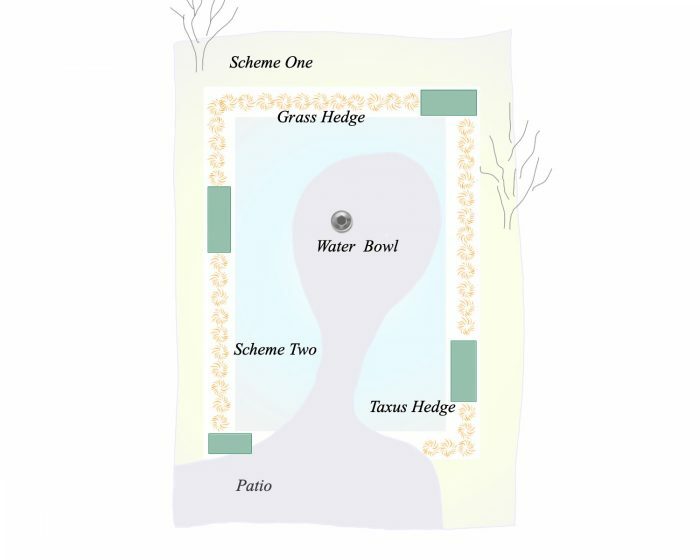 It would be tempting to allow the rest of the design to become a formal arrangement of patios and paths, but to both break with tradition and also to dramatise the transition of the informal spring garden into the formal enclosure focused upon its central water feature in summer, I have used organic curving shapes for the off-centre patio and paths. Two planting schemes are going to be used here: one full and dramatic within the grass hedge and surrounding the patio and one in the space between the hedges and outer boundary. The outer ring of perennial planting will be low-growing, especially interesting in spring and contain a high percentage of evergreen species such as ferns and sedges. 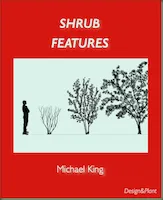 Practically this will work as many of the plants need to be shade tolerant both later in the growing season and at certain times of the day as the sun moves round causing the boundary fencing to cast shade over this outer zone. In full sun, the central area of this garden could be planted in numerous different ways according to taste. My choice here has been triggered by the central water feature from which I have planned narrow rivers of blue flowered salvias to flow outwards. The rest of the perennials used are chosen to work with this dominant element. Scheme One –Spring interest and shade tolerant with bold ferns and the addition of large clumps of autumn-flowering, taller-growing perennials. Complementary plants: Chelone obliqua in clumps of 6 every 3 meters along fence. Aster laevis in clumps of 3 every 3 meters along fence. Underplanted with snowdrops and daffodils for bold spring spectacle. Scheme Two – Blue rivers of salvias and dark mounds of Actea surrounded by seasonal flowering perennials and white flowered Pennisetum grassses. Complementary plants: Ribbons of Salvia nemorosa ‘Ostfriesland’ radiating outwards with Astrantia ‘Claret’, Geranium ‘Patricia’, Sedum ‘Xenos’, Astilbe chinensis var. taquetii. as occasional complementary plants within the theme plant mix. The fact that perennials grow from nothing to maturity in a single summer allows them to alter the garden spaces they occupy. The use of upright grasses here changes the mood of this garden completely in just one season. Throughout winter many of the plants used here will remain as interesting silhouettes with seedheads and dried stem skeletons. More schemes such as those used here are to be found in the Perennial Meadows eBooks together with details of the individual plants used. This entry was posted in Mind Gardens and tagged grasses, hortus, Perennial Meadows. Bookmark the permalink.